A few weeks ago, Ali took our neighbor, Omer Amca, to Kumluca. They bought two goats there, to be slaughtered during Kurban Bayrami, the sacrifice holiday, which is this week. Ali returned home with a crate of pomegranates and a sack of potatoes, but Omer Amca was still left with a sense of indebtedness towards him, it seems. For when Ali returned from a social call at Omer Amca’s house yesterday, where he was fed plate after plate of roasted goat, he had with him an entire goat leg, wrapped in plastic, along with about 2 kilos of goat fat. In the other hand he had a sack of goat ribs, which our newly wed neighbors Osman and Dudu had given him on his way home from Omer Amca’s house (their motivation is somewhat more obscure to me). Thus bestowed with such a huge amount of meat, I set about cooking the leg, after deciding to save the ribs for when my mother comes to visit. I love goat meat, having eaten a fair share of it as a child in Kenya. However, I do not consider meat to be my strong point in the kitchen. I had read a barbecue recipe that I thought sounded interesting in the Jamie Oliver book, Jamie at Home, a birthday gift from my friend Tuba. I read it again and found that it involved a home made barbecue sauce, baking at a low temperature in the oven, and then finishing over a charcoal fire. It sounded like a job that even a meat idiot could handle, so I got everything together for a goat roast. Since I was going to have the oven fired up anyway, I thought I ought to make an apple pie as well, and I wanted to make one that had a precooked filling because my oven is in a bad state right now, with no door to speak of, so I have to close it using a pile of rocks; thus, heat bleeds out of it pretty quickly, so time is of essence. My copy of the Joy of Cooking (1997) had a nice recipe for a deep dish apple pie with a cheddar crust (on top, not the bottom, thus eliminating soggy bottom crust) that fit the bill, so that went on to the menu. 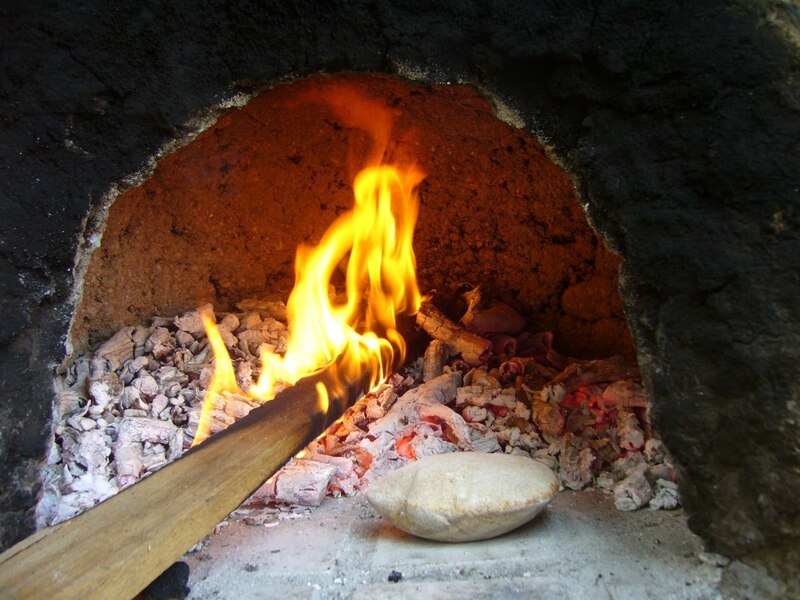 I also had some whole wheat pizza dough left over from a pizza extravaganza last week, so I decided to use it to make pita bread – this can be done with the fire still in the oven, so it would not cut into my retained heat. Baki helped me roll the pita bread out and enjoyed watching them puff up. His job was to count to 20 after they puffed up all the way, then we pulled them out. I pulled the fire out and put some into a copper brazier from my mom’s house in Cihangir to start the charcoal. Then, while the oven was soaking for 5 minutes (I closed the door and let it sit to allow the heat to even out a bit), I put the pie together. The meat was ready to go, covered in sauce and tented in foil, (and fitting nicely into a baking tin thanks to Ali, who whacked the shin off with a cleaver – that will make a nice stew later on) so when the oven was ready, in it all went, with a few potatoes thrown in for good measure. The pie cooked in about 40 minutes, and while I waited for the goat to be ready for grilling, I cooked some mushrooms in foil on grill. Ali had gone to see a friend in Beycik, and called to say that they would join us. With our neighbor Tulin in town from Istanbul, that meant 7 of us at the table. Suddenly, that leg didn’t seem so big. I was sure I wouldn’t get the meat cooked by the time everyone got there, but as it happened, I pulled it off the fire just as they arrived, and the whole thing went over pretty well. The meat tasted, to my impressionable mind, almost Chinese, and went a small way towards calming my raging obsession with char siu (Chinese roasted pork) which, naturally, I can’t get out here! Egemen, our friend from Beycik, had brought a bottle of his home made red wine that I took a tiny sip of to taste and it was grand. So it was, in the end, a fine, festive, holiday meal. (Although as I write this, I smell like smoke.) Iyi Bayramlar!